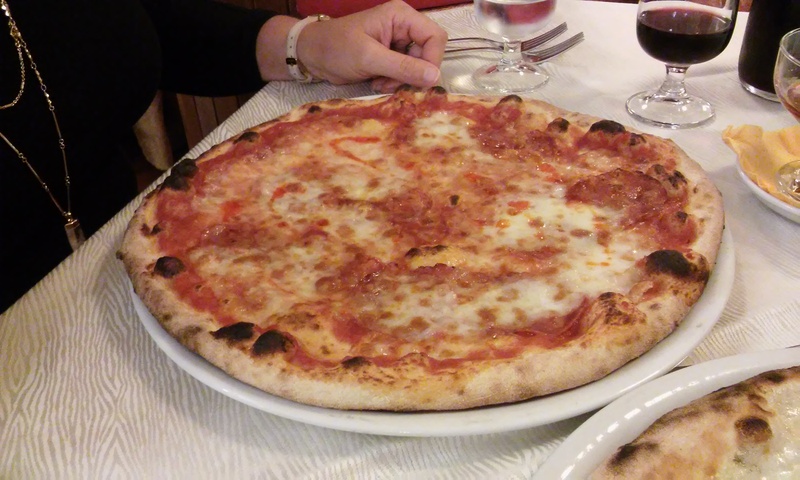 Pizza Here, Pizza There – Two Stories of Pizza – "Aye…brilliant"
Here I was in Italy surrounded by what this country is best know for – it’s food (fashion and shoes are second, I’m afraid). As good as the pasta was (I now proudly make my own orecchiette and strascinati), I grew to love the Neopolitan style pizza with its thin, but soft crust made with Tipo ’00’ flour. It is simple fare – three or four toppings, including any base sauce (white, olive oil or crushed tomatoes) and formaggi (cheese). Always made by hand (pizza dough is stretched – not tossed in the air while the chef sings O Sole Mio or Volare) and using only fresh ingredients, it is then baked in real wood fired brick oven. Pizza here is the best I have ever tasted. I used to proclaim I loved pizza so much, I even liked bad pizza – but no more. I am changed – a pizza connoisseur. Never again will I settle for a slice of Hobos Pizza. Arrivederci Delissio… Buon giornio pizza d’Italia! Pretty much wherever I went in Italy, I tried the local pizza, as the ‘recipes’ change from province to province and city to city. 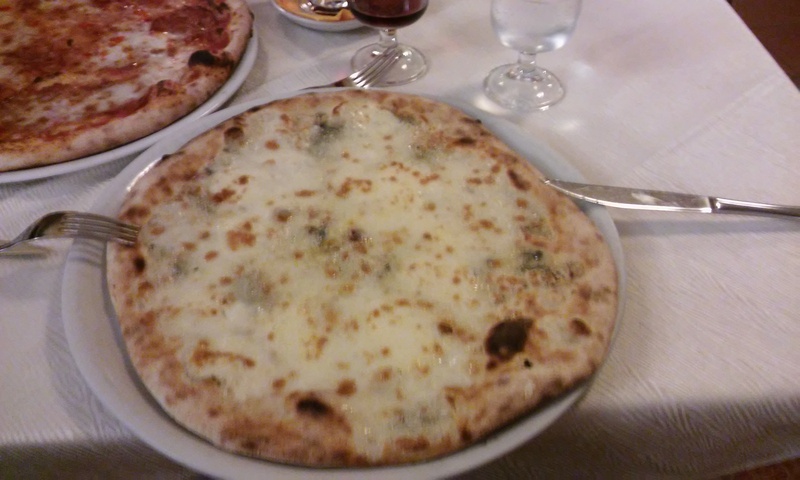 Milan, Naples, Rome, Lecce, Pompeii, Basilicata – no pizza tasted the same, but they were all very, very good. 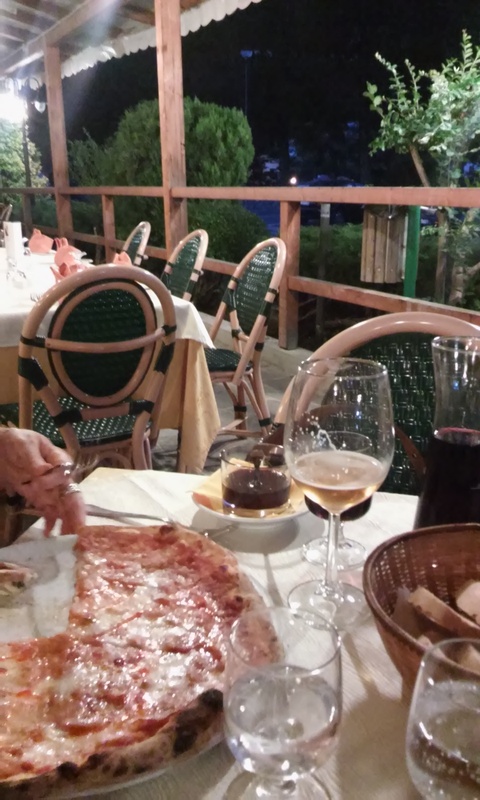 In Lago Sirino, there are two restaurants serving pizza, but our favourite was Albergo/Ristorante da Mimi. It is a locally owned and operated hotel and restaurant, with both owners working as chefs at the restaurant and other family members working as servers and managers. Fresh local produce is used whenever possible. Giuseppe, the owners son and head waiter, even picked blackberries from his grandmothers garden and made blackberry gelato that day. Alas, no pictures are available as the gelato was promptly devoured – two spoons! 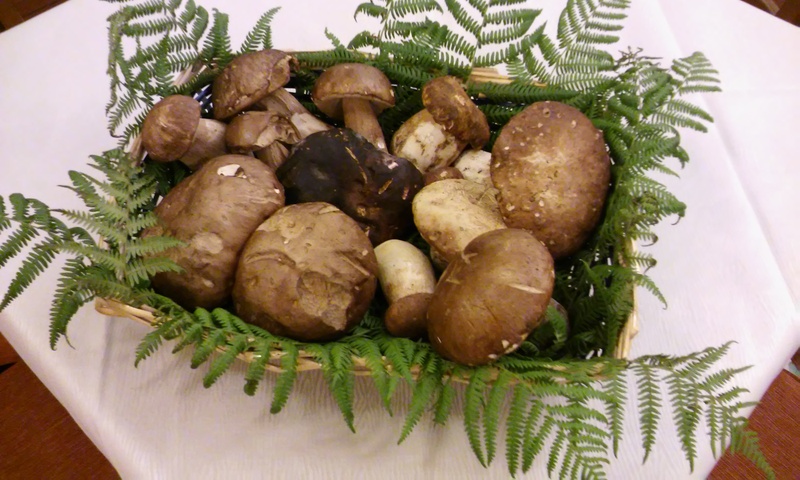 Salad made from those lovely mushrooms…yum! All of their food is outstanding – from pasta, salad, steak to seafood. But best of all is the pizza – and after trying a few, our favourites were the calabrese (a red pizza) and quarto formaggi (a white pizza). Our order became so predictable even Giuseppe and Fabiana would voice it to us before we had a chance- always with a great big smile. Why mess with something so good ? was my thought. We were never disappointed with our predictable choices. Calabrese pizza – I always added chili oil for a kick! Fresh and steaming from one very hot oven to table in two minutes. A mezzo litro of house red wine, a bottle of aqua frizzanta and two large pizzas, so inexpensive at 15 Euro. Follow that up with a cappuccino and their handmade gelato and it’s a meal that cannot be rivaled in taste. Quatro formaggi – pizza bianco. 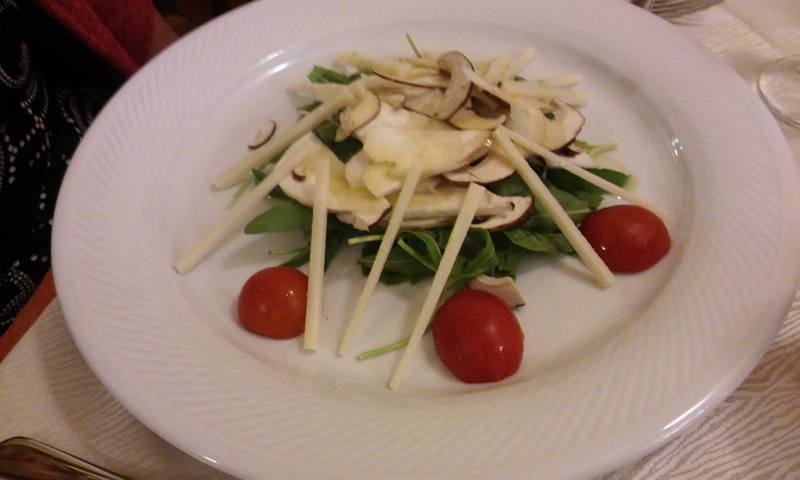 We took advantage of both taste and cost – often! 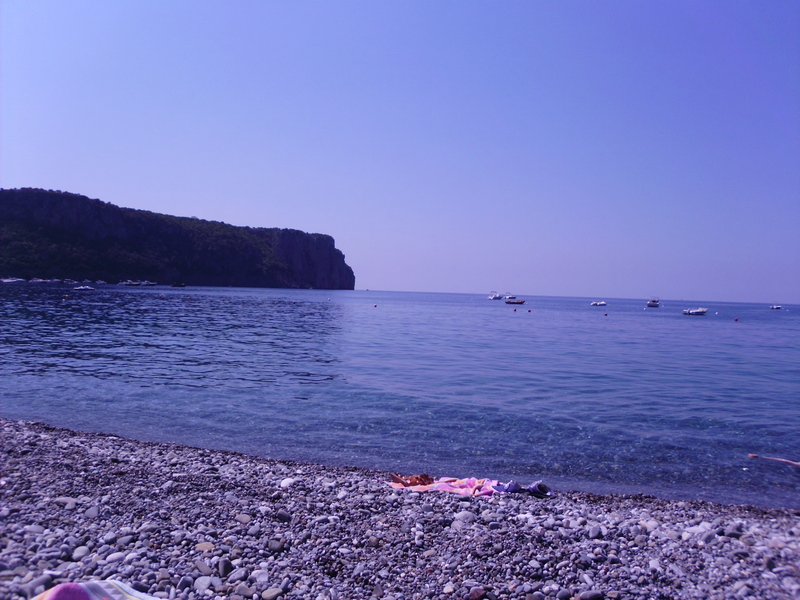 Praia a Mare. Just the beach – the bathers were camera shy. While Becky and Michael visited us in Italy, we ventured down to Praia a Mare one afternoon, a beach town in Calabria. A swim in the Mediterranean and a lie on the beach in the blazing sun had us looking for relief from the sun, a cold drink and a bite to eat. Although the holiday season was coming to an end and many restaurants along the beach had shut down for the season, we did find one at the very end of the beach road. No air conditioning inside, but it did offer a welcome respite from the hot day and we were hungry and thirsty. Unfortunately, pasta and salad was all we could order as Carlo the pizza chef/owner was off for the day, but our server proudly pointed to a large poster/mural on the back wall depicting this international award winning pizzaiolo. We ordered our pasta and cold drinks and then took a closer look at the restaurants wall of fame. Imagine my surprise when I saw the international competition he’d won was the Canadian Pizza Chef of the Year 2014 and 2015, sponsored by Canadian Pizza Magazine. Pictures of him in Italy and in Canada made me feel just a little closer to home and just a little bit proud to share him. Smack dab in the middle of a small town in southern Italy and we’d stumbled upon a Canadian connection – sometimes the world seems ridiculously small. A few minutes later our server returned to point out a young family sitting close to us. 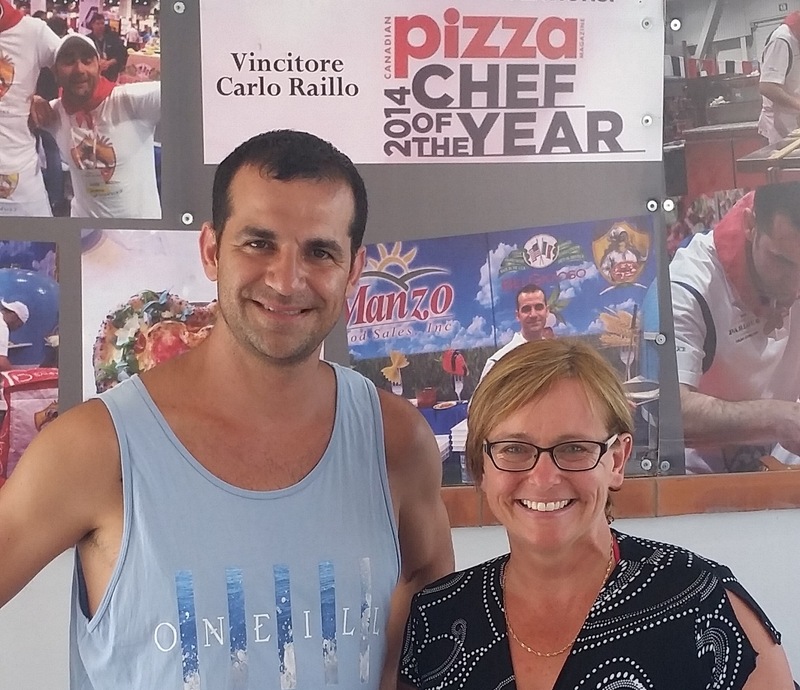 This was Carlo Raillo, the master pizza chef with his Canadian wife and daughters. Apparently, they come back to Praia a Mare every August, the busiest month of the year in Italy, to work in the family restaurant. This year had been extra hectic for him as he’d had to leave Alberta during the opening of his new restaurant home Buco Pizzaria and Vino in St. Albert, Alberta, Canada. Carlo and his family were lovely and while he seemed quiet and reserved, his lovely and obliging wife spoke to us at length about his work, obviously very proud of his accomplishments both in Italy and Canada. They were leaving in a couple of days to go back to Alberta. His daughters were two little cuties, each with dark eyes and a head full of curls. They quietly ate their lunch, then while the 4 year old played and scampered around, the 1.5 year old sat in the arms of one of the employees (probably a relative) at the reception desk, seemingly completely in charge and confident in her abilities to run the restaurant. The restaurant business must be in the blood. My money is on the youngest one to run the business side of things (she has a mean way with a calculator and an affinity for handling a phone), while the older one will wear the master chef’s apron. We left the restaurant not having tasted his pizza, but were invited back that evening as it was his last there for 2015. Sadly, we could not come as we had a long drive home. As of just a few days ago, it seems he may have nabbed the 2016 title also. Bravo Carlo – Canada and Italy are very proud. Posted on October 29, 2015 October 29, 2015 by jacquieharnettPosted in Food and drink, Italy, Life stories, TravelTagged Buco Pizza and Vino, Canadian Pizza Magazine, Food, Happiness, Italy, Pizza, Travel.